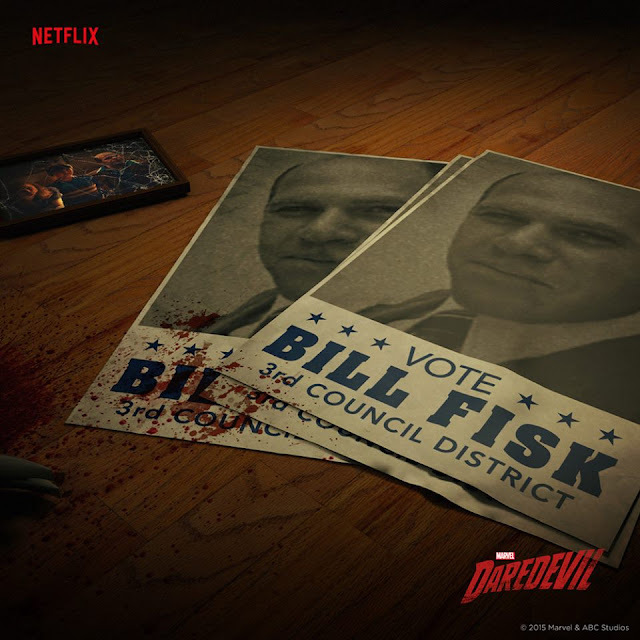 The episode starts off zoomed in on some silk sheets, then pans up to the face of Wilson Fisk. 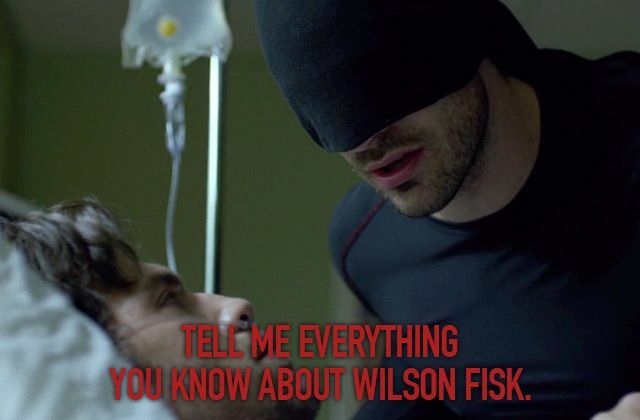 (It’s an interesting parallel that he sleeps on silk sheets like Matt does, as we saw in the last episode, “Stick.”) Fisk is having a nightmare, and suddenly he jolts awake, panting. He sits up and stares at the “Rabbit in a Snowstorm” painting that he got earlier in the season. Classical music plays as he cuts vegetables in his stately, austere kitchen. He continues cooking--cracking eggs and whisking them, then swirling butter around in a pan. He makes an omelet--always a good choice--and then eats it. It’s daylight now, whereas he’d been cooking in the dark. He sits down and sprinkles green stuff on it (Google says this green stuff is either green onions or chives). Wilson then takes a bite. The classical music continues as he walks past his rows of black suits. He chooses one slowly--I bet a lot of people wish they could take this long to get ready in the morning--then he puts on his shirt and opens up his drawer of cuff links, putting on the ones from his dad. He turns, and when he looks in the mirror there’s a kid staring back at him--a kid covered in blood. He walks backwards, staring at himself in the mirror, then shuts off the light. Fittingly, the red paint pours over everything in the opening credits looks kind of like blood. And of course, let’s take the obligatory moment to appreciate how beautiful the opening sequence is. When we return, the camera scans an apartment, showing carnage of Matt’s fight with Stick. A beer bottle is broken. We soon see Matt’s face as he’s woken up by his talking alarm clock. He’s still covered in blood from the night before. He sits up, looking haunted, then comes around the corner in a suit ready for the day. The bracelet from last episode is still sitting on a shelf in his apartment, and the camera lingers there as Matt walks out of the apartment. Elsewhere, Karen and Foggy are walking into work talking about how Matt won’t understand their meeting with Ben. Karen notices the bandage on Matt’s head, but he brushes it off as nothing and asks what they don’t want him to know. (See, I knew he heard it.) Foggy rolls his eyes and says that Matt’s like a bat but realizes his mistake and quickly says he didn’t mean it because Matt’s blind. Matt tells him that bats aren’t blind and that it’s a myth, and then asks again: what do the two of them not want him to know? Foggy shakes his head at Karen, but she blurts out that they’re investigating Union Allied. Matt immediately responds that it’s a bad idea since she signed the agreement with them back in episode 3. Karen promises she won’t go public and that someone else will take care of telling the story to the world. She doesn’t tell Matt what and continues to talk about how people like Union Allied are trying to force people like Elena (Mrs. Cardenas from episode 5) out of their apartments. Matt asks her what will happen if the people in charge find out, but Foggy says they already took care of that. Matt questions this, and Karen tells him with a sigh about the men coming after her… and Foggy following her. Matt asks why. Foggy: “She was acting funny. Matt says he’s worried Karen will get hurt, but Karen insists that she wants to do this. Matt asks who’s involved, who’s going to go public with this. 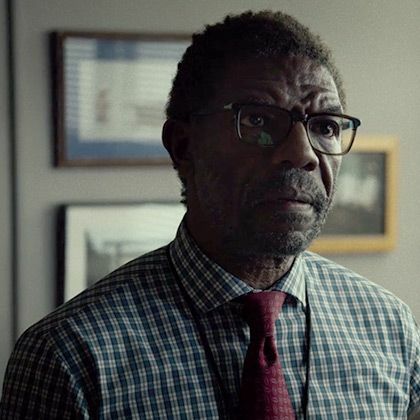 They tell him about Ben Urich, who will go public with the story. Matt expresses his concern about this, but Karen says she trusts Ben. After a moment of thought, Matt finally seems to let it go. Matt says they need to use the legal system to expose this instead of skulking around in the night asking to get hurt. Karen argues that using the legal system isn’t as heroic as you might think--ironic since Matt both skulks around in the night and uses the legal system. Matt says they’ll build a law built to target this, and Foggy and Karen reluctantly agree. Matt has a couple of rules, though. In the next scene, Fisk is talking to the Nobu with Wesley translating. Things aren’t going too well--Nobu is mad that Black Sky is dead since he was told Fisk would make sure the operation went down safely. Fisk says they cleared the police, so he kept up that end of the deal. Nobu says that it will be difficult to locate another Black Sky since they are rare. Fisk apologizes for offending the man, and Nobu leaves after rattling off something in Japanese. Wesley takes off his glasses, visibly stressed. Wesley insists that the man needs to be taught some manners, but Fisk says to leave it be. Wesley argues that the Russians couldn’t have gotten away with speaking to Fisk like that, but Fisk says these aren’t the Russians. Wesley asks what Nobu and his man bring to the table, and Fisk vaguely says they’re a necessary source of evil. Wesley says he doesn’t like how Nobu speaks to him, especially when things are going their way. Fisk looks at him solemnly and says that’s exactly when he needs to be cautious. We shift the scene to a room where rock music is playing on the radio. We see Wilson and his parents arguing about the level of the music. Wilson and his dad, Bill, are cutting wood and Fisk messes up. His dad demands an apology. We see what Wilson’s mom is working on--bills that are overdue. Bill holds up a poster that says people should vote for Bill Fisk for city council. He says this is the key to them getting rich. They’re going to get a real house. He offers a sip of beer to Wilson. Wilson hesitates, looking at his mom, but then takes a drink. Immediately, he spits it out. His mom gets mad at his dad. She asks how they’re paying for his campaign stuff and Bill says he got a loan--someone named Rigoletto floated him. Marlene is worried about this, but Bill reassures her and says they have to take risks. Wilson understands this, and Bill says that Wilson is smarter than Marlene. Bill hammers a poster onto the wood and the screen goes to black. We’re back to Adult Fisk, who is juggling multiple calls on the phone. One of them is Vanessa, whom he bids a reluctant goodbye. On the other line, it’s Wesley, saying that Detective Blake (who was shot in episode 6) has woken up from his coma. His injuries were extensive and he can’t speak yet, but if that changes he’s going to be mad and say something about getting shot. Fisk says to take care of him, but that’s an issue--there’s a 24 hour detail around his room. Only two of the police offers guarding the room are Fisk’s men; they won’t be able to get in without being seen. Fisk asks whether Blake’s partner, Hoffman, would be able to help. Wesley doesn’t think Hoffman will be willing to kill his partner, since they’ve known each other since they were in the police academy. Fisk says to set a meeting and that he’ll talk to Hoffman himself. We switch to Matt, Karen, and Foggy, who are brainstorming about Union Allied. Foggy isn’t too fond of Matt’s chosen method. Matt connects Union Allied to the company that hired them for the bowling alley case, as well as Westmeyer-Holt. They also connect it to Elena’s landlord, Tully. While looking at things on the internet, Karen finds an article about Blake regaining consciousness, and the three of them realize that he might know something. Wilson is meeting with Hoffman. He’s explaining the risks of Blake talking and that the result would be unpleasant for Hoffman and Fisk. Hoffman isn’t having any of it and insists he knows how to keep his mouth shut. Fisk explains that the reason they shot Blake is because he let the addresses slip that led the Masked Man to Vladimir. Hoffman cracks and says that he’s known Blake 30 to 35 years, and that they’re friends. Fisk seems affected by this but asks how much those years are worth to him. Hoffman is crying. We switch to a hospital in slow motion. An elevator opens, showing Hoffman with a haunted expression--he’s steeling himself for what he’s about to do. He talks to the guy guarding Blake. The guard says he needs to sign in and that he needs to also check his bag. Inside is a meatball sandwich, Blake’s favorite. Hoffman thought it might trigger something in Blake’s memory. The guard lets him in. Before Hoffman enters, he looks like he regrets what he’s about to do. He puts the sandwich on the bed and inside is a syringe. He says “I’m sorry” to Blake before injecting the syringe into his medical tube. Unfortunately, Blake wakes up and asks Hoffman what he’s doing. Suddenly, the Masked Man appears behind Hoffman and chokes him until he passes out. Blake’s breathing is ragged. Matt blocks the door with a chair so he can talk to Blake. Matt tells him he’s going to die soon and that there’s nothing anyone can do about that, but that Blake can make it worse for the person behind his murder. Blake mumbles, “Is it my turn for this?” Before he can say anything else, the police break into the room, finding the Masked Man gone and Hoffman passed out on the floor. Leland is concerned he may be in danger because the Masked Man has already found him once. Fisk says he’ll have six men watch over him. Leland insists that he should have a dozen men by him because he has a whole lot of money that goes with him if he dies. 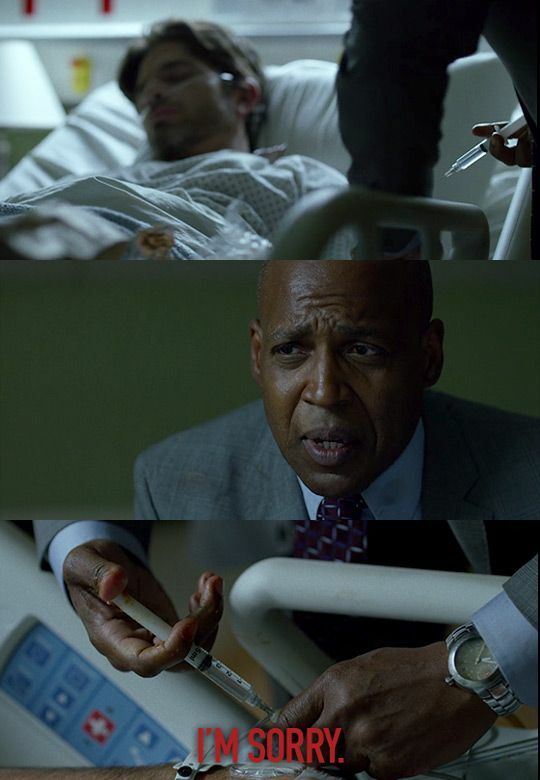 Wesley arrives and Fisk asks if it’s done. Wesley says yes, but there was a complication--a familiar word these days--and explains what went down. They find out Blake might have told the Masked Man something. Thankfully, Hoffman managed to come up with a cover story by telling the police that the Masked Man killed Blake. Leland overhears all this and, before leaving, implies that things are out of control. Wilson is crying. His mom gives him some cake and tries to console him. Wilson asks if what Bernie said was true, but before we can get a clear answer, Bill comes in. He says Marlene gives him too much cake and that Wilson will get fatter than he already is. He asks Wilson to tell him what happened. A kid named Bernie was knocking Bill’s campaign signs down. Wilson told him to stop, but Bernie told Wilson he was a loser just like his dad. Bill tells Wilson to get his coat. Wilson hesitates, but Bill yells at him and Wilson obeys, looking afraid. Marlene gives him a reassuring pat as he leaves. They track down Bernie, who’s hitting a bottle off of a post with a baseball bat. Bill confronts him about what he said. Even though the campaign is over, Bill is determined to prove he’s not a loser. Bernie says he didn’t call him a loser, his dad did. That’s when Wilson wakes up from his nightmare and stares at the painting again. We see a repeat of his morning, making eggs and eating them, then picking out a suit. He gets dressed, and right as he’s putting on his cuff link, his phone rings. He answers it. It’s Wesley--Madame Gao wants to speak with Fisk, and she doesn’t want an appointment: she’s coming to him now. Fisk asks if Wesley can get there before she arrives. He’s on his way. They meet in Wilson’s dining room, with Wesley translating as Madame Gao speaks in Mandarin. Fisk pours tea for Gao, which she approves of. 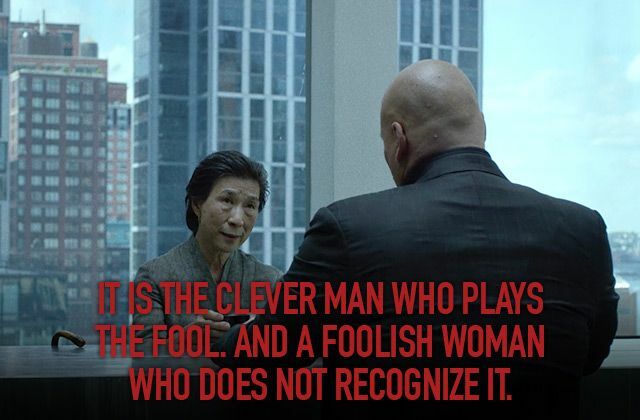 Fisk says got it from Gao’s country with her in mind. But Gao didn’t come for tea. She speaks English, and Wilson speaks Mandarin. Wesley looks slightly annoyed at this revelation, like he is unnecessary. Poor guy. Madame Gao says she knows that he speaks Japanese as well, like Nobu. Soon Gao dismisses Wesley and he seems like a rejected third wheel. Again, I say: poor guy. After she leaves, Fisk lets out a frustrated noise and overthrows a table. This is honestly top-notch acting from Vincent D’Onofrio. Wesley comes in, but Fisk yells at him twice to get out. We flashback to Bill picking up a chair and telling Wilson to sit in it, facing the wall. Bill tells Wilson to think of what kind of man he wants to be because Wilson is weak. Wilson stares at the blank wall, which looks like his painting Rabbit in a Snowstorm. As Wilson contemplates his apparently wrong life choices, Bill is off to take care of something that can’t wait. He’s going to talk to Rigoletto, whom he owes money to. He’s putting on his cuff links. Marlene gets angry and says that she told him he shouldn’t have borrowed that money. Bill yells at her and hits her, then starts beating her with his belt. Wilson stares at the wall as she screams in the background. Wilson Fisk--grown-up--is staring out at the city, pensive. Wesley approaches behind him, asking if Fisk needs something. Fisk dismisses him brusquely. Vanessa tells him they’ll be all right, so Wesley leaves. Fisk asks her to leave, but Vanessa stays and tells him that his friend, Wesley, is worried about him. Vanessa reminds him of his promise to always be honest to her and asks him to tell her what’s wrong. Wilson says he’s afraid… afraid of the way she’d look at him if she knew. Vanessa tells him to tell her. We return to the beating scene. Wilson is crying as his father beats his mother. Finally, it becomes too much. We see the moment of decision on Wilson’s face as he stands up. He picks up a hammer and yells at his dad to stop. His dad taunts him, implying that Wilson is weak, then he turns around to speak to his wife. From behind, Wilson raises the hammer and hits his dad in the back of his head. With a stricken expression, Bill falls to the ground. Wilson keeps banging the hammer at his dad’s head while yelling, “Keep kicking him!” He gets covered in blood, and his mom pulls him into a hug. As he hugs her, he continues to stare at the white wall. His dad’s fingers twitch. Then his mom says to get the saw. Slowly, Marlene takes off Bill’s clothes--including the cuff links. She gives them to Wilson. Marlene saws at her husband’s body while Wilson looks on. We flash back to Grown Up Fisk, who is touching his cuff links absentmindedly. He’s told Vanessa all of this, who looks visibly horrified. Wilson says they carried his father in bags down to the river, one each night for the next week. Everyone thought his father had left town to avoid Rigoletto. Fisk was sent to live with relatives at the farm. Vanessa tells him it wasn’t his fault and that he was protecting his mother. 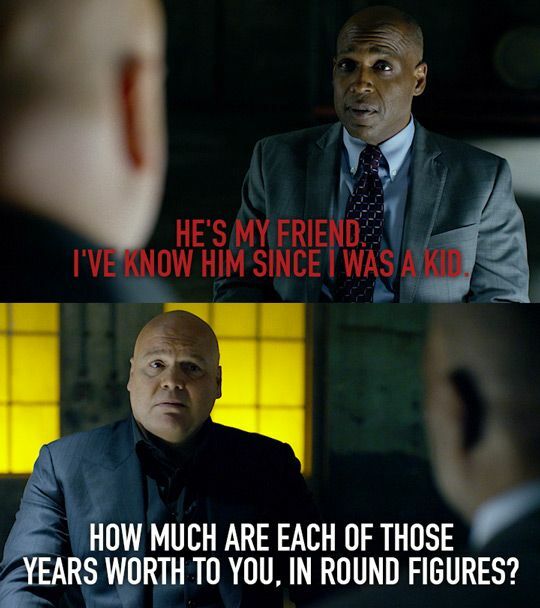 Fisk insists he didn’t do it for her, he did it for him. That’s why he wears the cuff links: to remind him that he’s not cruel for the sake of cruelty. That he’s not his father. That he’s not a monster. Fisk says it won’t matter soon; there are people who want to expose him. They don’t understand what he’s trying to do for this city, they just want to drag his name through the streets and destroy everything he’s trying to accomplish. Vanessa asks if he’s going to let them and Fisk says no. He won’t. Rain is pouring as Ben shouts at someone on the phone. Other than whoever’s on the other line, Ben is completely alone. In the dark. Ben drops his keys and says he’ll call the person back. He picks them up. When he comes back up, the Masked Man is behind him saying they need to talk. The Masked Man--Matt--asks if Ben knows who he is. Ben says, “the devil of Hell’s Kitchen.” Matt asks if he believes what they’re saying about him. Ben says he isn’t sure, but he’s heard the other stories about Matt, the ones where he helps people. Ben thinks that there might be another side to him. Matt says he didn’t do any of the things he’s been accused of. Ben asks if he wants him to write his side of things. Matt says no. Ben mentions the girl the Masked Man saved--Karen. He says she’s a good kid and that Karen believes the Masked Man is a hero; Matt says people like her are why he does this. Ben says he can’t print info that Matt’s beaten out of people--it’s not credible information. Matt says he was at the hospital when Blake died. He tells him it was Hoffman who killed Blake. Ben asks if he has someone to corroborate this; he needs reliable sources since “he said she said” will not put this guy away. Matt says they don’t need to put him away, just drag him into the light. Matt would bet his life that Wilson is the guy at the top. Ben says that Matt is betting Ben’s life now too, then tells Matt to tell him everything he knows. Fisk is in bed again--a different time than before. He wakes up from another nightmare and this time, Vanessa is next to him. He holds her close. He wakes up, and we see him eating breakfast, but Vanessa is there. She gives him a hug and sits down, all while Ben gives a voice over. 'You get what you deserve'. It's an old saying. One that survived the years, because it's true. For the most part. But not for everyone. Some get more than they deserve. Because they believe they aren't like everyone else. That the rules, the ones people like me and you, the people that work and struggle to live our lives, just live, don't apply to them. That they can do anything and live happily ever after, while the rest of us suffer. They do this from the shadows. Shadows that we cast. With our indifference. With a pervasive lack of interest in anything that doesn't directly affect us, we, in the here and now. Or maybe it's just the shadow of weariness. Of how tired we are, struggling to claw our way back to a middle class that no longer exist, because of those who take more than they deserve. And they keep taking, until all that's left for the rest of us is a memory of how it used to be before the corporations and the bottom line decided we didn't matter anymore. But we do. You and I, the people of this city we still matter. There's someone in Hell's Kitchen that doesn't share this belief. He's been among us for quite some time. You've never heard his name. You've never seen his face. He's stayed in the shadows. Because men like him, men that want to control our city, our lives, fear the light and what it reveals. This man must no longer be allowed to operate in the darkness. If he has nothing to hide, let him step forward. Vanessa sorts through his suits now and picks one out--this time his suit is in a lighter shade. She picks out a different set of cuff links for him; squares. He puts it on and she puts a handkerchief in his pocket. 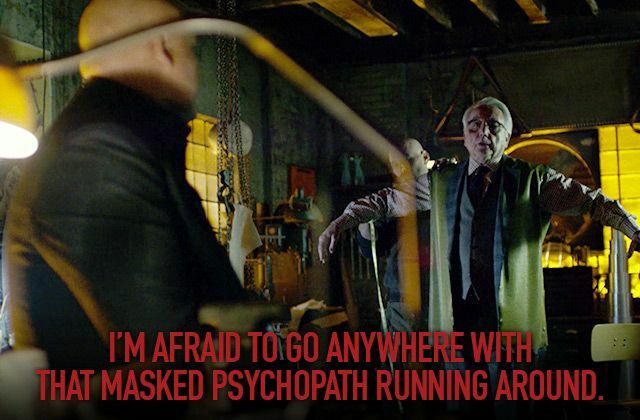 Fisk looks in the mirror, and this time, there’s no bloody kid staring back. We see Ben in front of a computer--the voice over is what he’s typing. 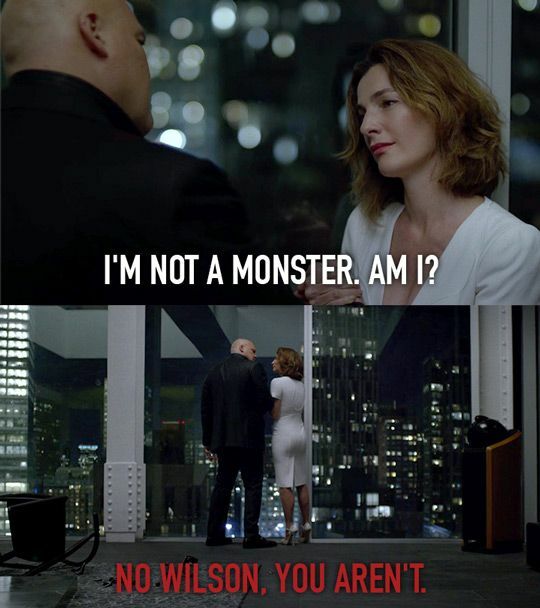 It’s the story that will expose Wilson Fisk for what he is. But before Ben can get further, he turns on the TV. There’s a press conference featuring Wilson Fisk. He promises to aid Hell’s kitchen and to stand against the Devil of Hell’s Kitchen. In his apartment, Matt hears about this, too. We see Foggy and Karen watching the news from various places around the city. Fisk gives a rousing speech about how they can’t bow down to intimidation and how they need to stand up to evil men. He references Leland’s assault, which was a message meant for Fisk: a message to give up his dream of a better city. 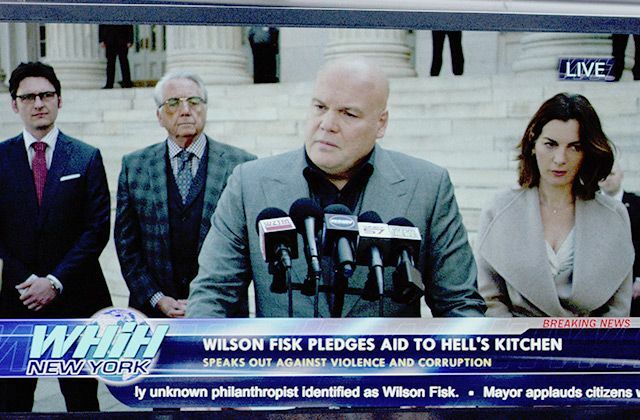 Fisk just wants the citizens of Hell’s Kitchen to feel safe. He tried to do this quietly, not wanting to draw attention. We see Ben again. He takes off his glasses and rubs his face. This is bad. Fisk says he cannot keep living in the shadows, afraid of the light. Ben clicks to close out of his document. He is asked whether he wants to save his document. He doesn’t. NO, BEN, NO. Matt flings his laptop off the table and looks disturbed as the camera fades to black. Have you seen "Shadows in the Glass"? What did you think?